Seeing your offspring interested in sewing may be a real joy, especially if you trust him enough with a machine that may produce serious injuries if not properly used. After you get over the shock that you will no longer shop for clothes for your kid (well, this may be debatable, but let’s hope for the best), you need to face the real thing: you do need to make an investment for your kid’s dream. It’s common sense to know that you want this sewing machine to be easy to operate, lightweight and to help your kid sew at his/hers own pace. Safety comes first, but this doesn’t mean you should get a sewing machine that doesn’t encourage your kid to get very creative. Let’s get a bit closer with the details and decide what is the best sewing machine for kids. Totally random, it’s important to look for sewing machines with Snap-On feet that securely stay in place. 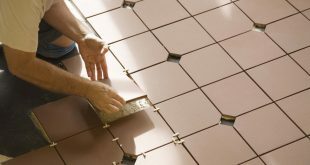 Better yet, get the feet attached on with screws- you can never be too safe! Don’t know if you should get the pedal or the push button? Your kid is better to decide on that as he/she knows which way it feels more comfortable. In addition, if the struggle is too intense, the push-button models are there to help your kid. Some of us out there are also trying to teach our kids about patience and what better way to do it than having them thread the needle? However, if they become too frustrated, it’s better to go with an auto-threaded. Go also for the models with speed control and not too many stitching options. You don’t want your kid confused right from the beginning and settle for the basic stitches on the machine (reverse, zigzag, and straight). The list of features is not complete until we mention the bobbing winding. 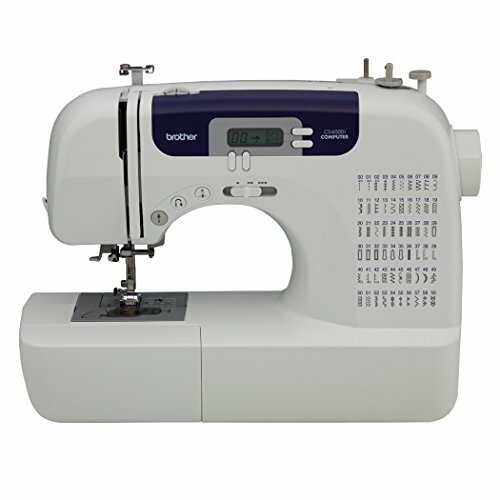 You want a sewing machine with a bobbing slot that is easy to access and the bobbin should be easy to install also. These are the main tips and you may get carried away when shopping, especially if you do it along with your kid. Moreover, never forget the finger guard…better safe than sorry, remember? 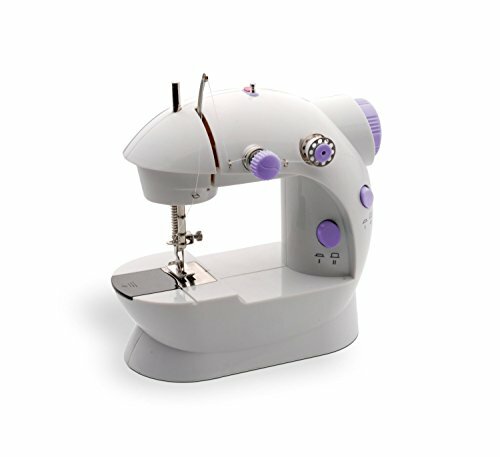 If you want to teach your kid ho to sew but don’t want to invest too much as it may only be just a phase, you can sure try the Michley LSS-505 Lil’ Sew & Sew Multi-Purpose Sewing Machine. The machine is not only easy to use, but it’s also easy to understand and quite simple when it comes to functions. It offers your kid 8 built-in stitch patterns that work very well. Your kid gets to choose one of the two speeds of the machine and may experience a lot with forward and reverse sewing. The automatic thread rewind, the double thread help your kid work faster and easier also. 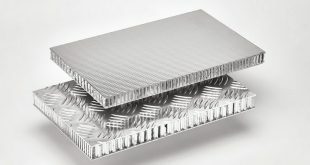 The machine is versatile and may be used for many types of materials. It features built-in sewing light and has either hand switch or food pedal to start. The list of features also includes a thread cutter, an adaptor and a drawer so that your kid organizes its sewing kit. The machine may be cord powered or battery operated. It comes with an AC adapter to use when you run out of batteries. You may use the machine for your kid to learn sewing or for your own purpose, for some basic jobs. The machine is cute, small and easy to carry around. Regardless the few draw backs, we still consider the machine to be a fair option for your kid to learn the basics in sewing. When you give your kid the Janome Fastlane Fuchsia Basic, chances are your kids will absolutely fall in love with it, considering its cute appearance. 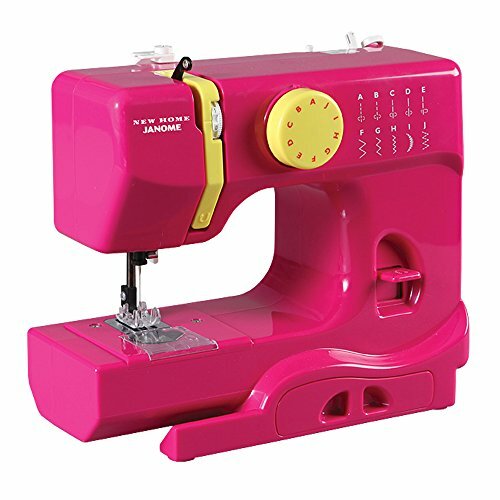 However, the Janome Fastlane Fuchsia Basic is more than just looks and makes it as a great option for your kid to learn his/hers ABC on sewing. 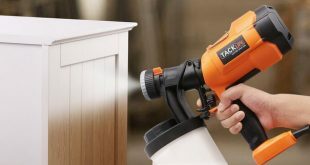 The machine is lightweight and very easy to carry around. It comes with basic features, which is why it’s so good for any beginner. It features 10 built-in stitches, including the most popular ones: zigzag, straight, crescent with two needle positions. The list of features includes also the free arm, the easy reverse and the accessory storage that solves many problems, teaching your kid to be organized just as well. The machine is easy to set-up and the threading diagrams, the top drop-in bobbin with clear cover also count on the easier use. You don’t need to worry on safety either as the presser foot comes with finger guard that protects the little fingers of your kid. 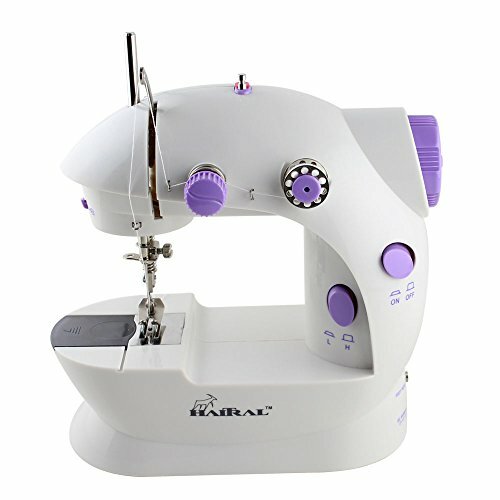 When we go through the features, we also see the adjustable tensions, the four-point feed dog system, the left and center needle position, the easy stitch selection and the extra-high presser foot lift. With a cute look, great colors and a perfect size for a kid to carry around, the machine is a great choice any time. All in all, for a very good price, you get a cute looking, easy to use and carry around dependable sewing machine for any kid. There’s no secret for any parent…when it comes to Hello Kitty, it’s very difficult to resist your kid. 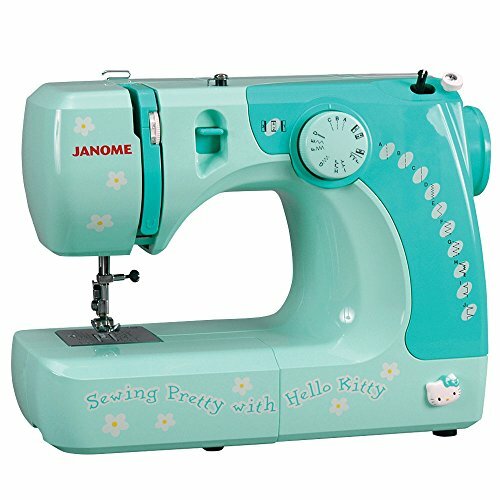 So chances are your kid is going to be excited Janome 11706 3/4 Size Hello Kitty Sewing Machine from the very first look. But the machine is more than just a cute appearance and it teaches your kid the first steps in sewing and bit more also. The machine comes with eleven stitches so your kid gets easily through the basic stitching and some creative stitches just as well. 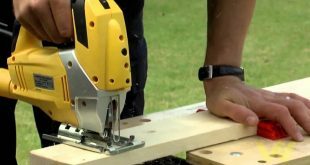 The machine presents several features that ease up your kids first lessons. He/she comes to appreciate the free arm, the four-step buttonhole, the 3-piece feed dog. The very high presser foot lift makes sewing easier, as it does the stitch selection dial. The push-pull bobbin winder, the vertical oscillating hook bobbin, the snap on presser feet, the reverse lever and the easy tension control dial are all features that make things easy for any beginner, not only for your kid. The machine has a good weight and it’s light enough for your kid to carry around, but heavy weight enough to have good stability. The accessory storage is great for any kid that is learning how to be more organized also. The machine has a solid build, is made to last and simply looks adorable. The minimal issues aren’t deal breakers though and we think the machine makes happy any kid that likes Hello Kitty and sewing at the same time. Give your kid the chance to get better at sewing with the Brother CS6000i Feature-Rich Sewing Machine. The machine is versatile and comes with plenty of features that help your kid sew. Your kid is helped to select stitches and adjust stitch length/width by the easy to use LCD display. The display is user friendly and quite responsive just as well. The machine features stop/start button and presents also a foot control. Your kid gets to set the speed according to his/her job. The risk for jamming is minimal and so are the efforts to drop-in bobbin. The quickset top lets your kid access bobbin thread very easy. The machine comes with several accessories that are stored inside a compartment on the arm of the sewing machine. 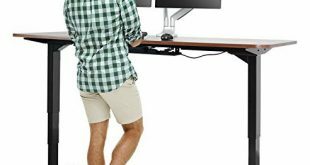 The very bright working area, the built-in free arm for cuffs and sleeves increase the ease of use. In addition, in case your kid is ready, the oversized table that comes along makes possible even quilting. The machine is ideal for your kid to learn the basic on sewing, but also to encourage him/her for bigger projects. It’s a computerized option so it lets your kid know when something is wrong through the clear LCD screen. It’s easy for you to setup the machine. It has a solid build and runs very quiet. 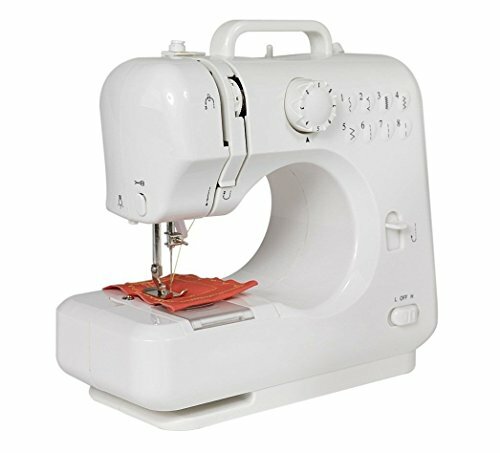 Despite the minimal issues, the machine still makes it as a great option for your kid to begin his/hers journey on sewing. 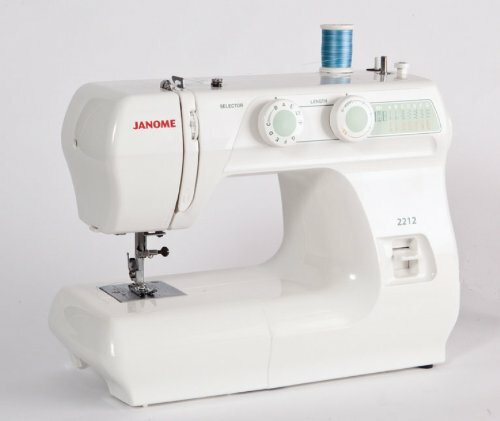 If you are willing to invest in a high quality machine for your kid, then you can’t fail with the Janome 2212 Sewing Machine. The machine is a great option for any beginner, kid or not, and comes with plenty of features that ensure ease of use for the basics. Your kid is going to like the 12 built-in stitches, the four-step buttonholes, the presser foot, the dial pattern selection. The machine is versatile and the stitches are easy to adjust in both width and length. The several features include also the free arm, the drop feed that lets your kid get quite creative. The machine is mechanical which means that is easier to fix in case of anything. The bobbin winding is also easy to do and the bobbin case is placed in front, which is comfortable. The storage tray is easy to use for organizing and is conveniently placed in the removable arm. The machine is small, lightweight and is user friendly. It runs quiet and is very easy to carry around. The minimal issues aren’t a problem for us and the machine is a great buy anytime. 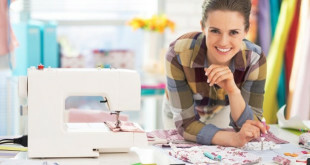 Going shopping for a sewing machine for your kid is no picnic as you face two problems: finding a sewing machine that is both easy to use and nice looking. The market gives you plenty of options and you can’t be very far from this principle with the Sewing Machine Mini 2-Speed Double. The machine is small and lightweight, which already makes it a winner for any kid or beginner use also. The multiple features increase its value and list begins with the two speeds on the machine. We also notice the double tread, the good stitch control or the top drop-in bobbin for easier threading. The machine is easy to operate and comes with both hand switch and foot pedal. It may be battery operated but comes also with an AC adaptor. The instruction eases up your minimal efforts when it comes to setup or use. Your kid may use the machine on a good variety of materials, from silk to denim. The machine has a good build and is very easy to carry around. No matter the small issues, we think that, for the money you pay, you get a great reliable choice for your kid to learn basics in sewing. We all know kids change their minds rather fast and sometimes you don’t really want to make a big investment in this week’s interest of your kid. However, you can never be too sure, so it’s not a bad idea to put some thought into it and really get something good for a low price. It’s the case of the Michley LSS-202 Lil’ Sew & Sew Mini 2-Speed Sewing Machine that may surprise you its reliability for some basic sewing tasks. 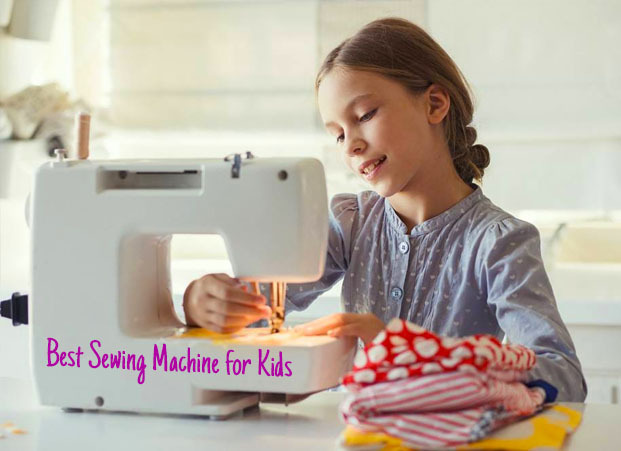 The machine is a basic tool that is easy enough to operate by any kid and…even by grown-ups who know nothing on sewing (nor want to get on a higher level anytime soon). Your kid may use the machine for many types of materials, from silk to denim. It’s easy to operate as it features both hand switch and foot pedal. The top drop-in bobbins makes the threading easy for most of kids out there, whereas the automatic thread rewind makes things easier for all. The machine presents two speed sewing and double thread so that your kid gets better control over the stitches. The stitches are long, but look nice. Your kid may use the machine with batteries or with the included adaptor when the batteries worn out. Just that you know, the machine uses DC 6V power. Don’t be surprised by the machine’s size as, small as it is, the machine handles very well the basic tasks on sewing. The small size relates to the lightweight of the machine, increasing its portability. Despite the minor issues, as it’s small, lightweight and so easy to operate, you can sure give it a go with the machine next Xmas.